Un mapa del siglo XVI guardado en la cámara de una biblioteca de Los Ángeles prueba que los primeros europeos que descubrieron Australia fueron los aventureros portugueses, no los británicos ni los holandeses, según un nuevo libro. 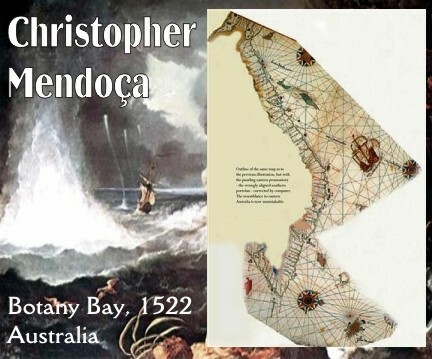 El libro "Beyond Capricorn" dice que el mapa, que marca exactamente los accidentes geográficos de la costa este australiana en portugués, prueba que el navegante Christopher de Mendonça lideró una flota de cuatro barcos que llegó a Botany Bay en 1522, casi 250 años antes que el capitán británico James Cook. 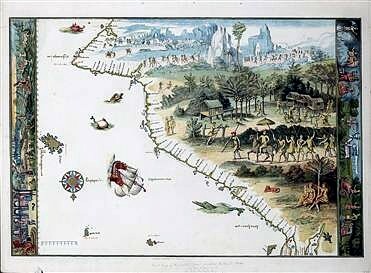 El escritor australiano Peter Trickett dijo el miércoles a Reuters que cuando amplió el pequeño mapa pudo reconocer todos los cabos y bahías de Botany Bay en Sidney, el sitio donde Cook reclamó Australia para Reino Unido en 1770. Trickett dijo que se topó con el mapa hace ocho años en una librería de Canberra. En la tienda había una reproducción del Atlas Vallard, una colección de 15 mapas dibujados a mano y terminados no más tarde de 1545 en Francia, y que representaban el mundo conocido hasta ese momento. "Dan (los mapas) pruebas abrumadoras de que los barcos portugueses hicieron atrevidos viajes de descubrimiento a principios de la década de 1520, sólo unos pocos años después de que viajasen al norte del país para alcanzar las islas Spice, las Molucas," señaló el escritor. "Esto fue un siglo antes que los holandeses y 250 años del capitán Cook," agregó. El escritor cree que las cartas de navegación originales fueron elaboradas por Mendonça, que salió desde la base lusa de Malacca con cuatro barcos en una misión secreta para descubrir la "isla de oro" de Marco Polo al sur de Java. El descubrimiento de Mendonça se mantuvo en secreto para evitar que otras potencias europeas llegasen a la nueva tierra, dijo Trickett, que cree que su teoría está apoyada por los descubrimientos de artefactos portugueses del siglo XVI en las costas de Australia y Nueva Zelanda. SYDNEY (Reuters) - A 16th century maritime map in a Los Angeles library vault proves that Portuguese adventurers, not British or Dutch, were the first Europeans to discover Australia, says a new book which details the secret discovery of Australia. 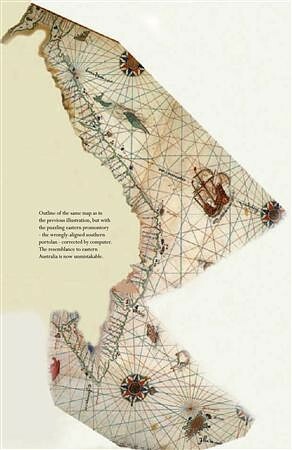 The book "Beyond Capricorn" says the map, which accurately marks geographical sites along Australias east coast in Portuguese, proves that Portuguese seafarer Christopher de Mendonca lead a fleet of four ships into Botany Bay in 1522 -- almost 250 years before Britains Captain James Cook. Australian author Peter Trickett said that when he enlarged the small map he could recognize all the headlands and bays in Botany Bay in Sydney -- the site where Cook claimed Australia for Britain in 1770. "It was even so accurate that I found I could draw in the modern airport runways, to scale in the right place, without any problem at all," Trickett told Reuters on Wednesday. Trickett said he stumbled across a copy of the map while browsing through a Canberra book shop eight years ago. He said the shop had a reproduction of the Vallard Atlas, a collection of 15 hand drawn maps completed no later than 1545 in France. The maps represented the known world at the time. Two of the maps called "Terra Java" had a striking similarity to Australias east coast except at one point the coastline jutted out at right angles for 1,500 km (932 miles). "There was something familiar about them but they were not quite right -- that was the puzzle. How did they come to have all these Portuguese place names?," Trickett said. Trickett believed the cartographers who drew the Vallard maps had wrongly aligned two Portuguese charts they were copying from. It is commonly accepted that the French cartographers used maps and "portolan" charts acquired illegally from Portugal and Portuguese vessels that had been captured, Trickett said. "The original portolan maps would have been drawn on animal hide parchments, usually sheep or goat skin, of limited size," he explained. "For a coastline the length of eastern Australia, some 3,500 kms, they would have been 3 to 4 charts." "The Vallard cartographer has put these individual charts together like a jigsaw puzzle. Without clear compass markings its possible to join the southern chart in two different ways. My theory is it had been wrongly joined." Using a computer Trickett rotated the southern part of the Vallard map 90 degrees to produce a map which accurately depicts Australias east coast. "They provided stunning proof that Portuguese ships made these daring voyages of discovery in the early 1520s, just a few years after they had sailed north of Australia to reach the Spice Islands -- the Moluccas. 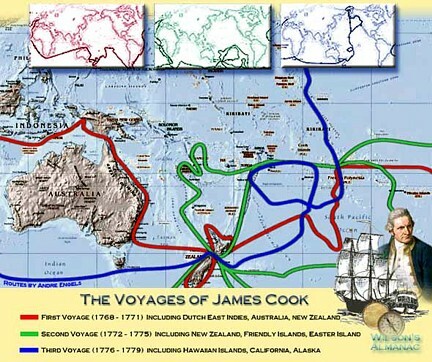 This was a century before the Dutch and 250 years before Captain Cook," he said. Trickett believes the original charts were made by Mendonca who set sail from the Portuguese base at Malacca with four ships on a secret mission to discover Marco Polos "Island of Gold" south of Java. If Trickett is right, Mendoncas map shows he sailed past Fraser Island off Australias northeast coast, into Botany Bay in Sydney, and south to Kangaroo Island off southern Australia, before returning to Malacca via New Zealands north island. Mendoncas discovery was kept secret to prevent other European powers reaching the new land, said Trickett, who believes his theory is supported by discoveries of 16th century Portuguese artifacts on the Australian and New Zealand coasts.